With an incredible 25-year career that has taken her from Tokyo to Los Angeles, Mitsuko Osuga has mastered the art of creative floral design. 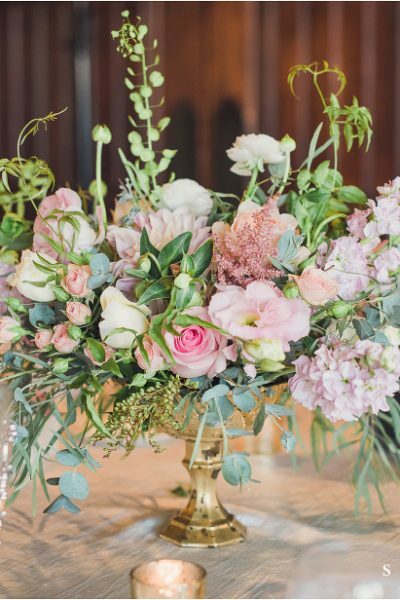 Founder of California-based Mitsuko Floral, she has added her own imaginative touch to many events, and collaborated with brides-to-be to help them realize their dream day. Her business is now lauded as one of the best wedding vendors. She continues to work with brides to transform their venues into unique spaces and create personalized bouquets. Mitsuko has kindly agreed to be interviewed for our latest ‘Influencer and Expert’ series, sharing her insider knowledge for those planning weddings or special occasions, and has spoken about the impact flowers can make on your big day. JOVANI: What initially got you interested in becoming a florist? MITSUKO: I loved everything about flowers. The fragrance, the vibrant colors, the romance, the ability to create things and uniquely tell a story with each floral design and arrangement. It’s with this fervor then that I went on to pursue my floral design degree and eventually my certificate in Professional Floral Instruction from Parsons The New School of design in Manhattan. Angie Ohman is a Sherman Oaks based personal trainer who specializes in working with women. Angie motivates, guides and inspires her clients to reach their fitness goals, even when they’re working within a limited time frame. Also a nutritionist, Angie is keen to see those who she works with make permanent healthy changes to their lifestyles. Helping brides prepare for their big day is one of her key services. She explains that those gearing up for such a big life event are often the most motivated. She has shared with us her own personal tips and training secrets for brides-to-be. Revealing some of her insider knowledge, Angie has spoken to Jovani about fitness, health and keeping that motivation to reach those goals! JOVANI: Tell us a little about your own approach to fitness? ANGIE: I train women only and specialize in weight-loss and lean toning. I’m also a sports nutritionist, so I’m very involved in my clients’ health in all ways. Alexa Gallo, photographer behind BrightBird Photography, has kindly agreed to take part in our latest Expert Interview. Alexa has a unique vision when it comes to capturing the spirit of an event. She shuns the conventional – bringing depth, emotion and raw beauty to her photographs. A frequent wedding photographer, Alexa prefers to create intimate portraits that tell a story. Her images capture those behind-the-scenes moments that relay the true experience. Her attention to detail and flare for the original is what sets her apart. As an expert in her field, Alexa has shared a few of her secrets for capturing incredible and personal photos. If you have prom coming up or just want to perfect the art of the selfie, she has let us in on her top tips that you can make your own. She has also spoken on her own approach to photography and the art of creating authentic work. Camera at the ready? Then read on! JOVANI: What would you say is the most important part of your job? ALEXA: The most important part of my job is to see the beauty in any situation.